is the KM Baja worth it? I am currently living overseas in China and the guy at my LHS if you can call it that will order in a KM Baja for me if I want, for a little less than 400 dollars. I would like to know is it worth it? I have seen the local guy's run but It's a bit older so I think it has a CY engine which might be why it runs good. If I could order one of these with a CY engine do you guys think it would be worth the money? Currently theres a nitro shortage still in china from the olympics and I haven't gotten a gallon of nitro for 6 months, and I would like to get one of these gas cars. RE: is the KM Baja worth it? Wonder when you move from China how easy parts will be to get? I think its well worth it. If I had an extra 460 dollars laying around I would of had one shipped to my house 6 months ago. $460 shipped is excellent and 400 is awesome! I would get it. It shares parts with the HPI 5B. Yes! very much worth the money, and this comes from someone whos motor failed on the 3rd tank of gas and had to rebuild the topend.. 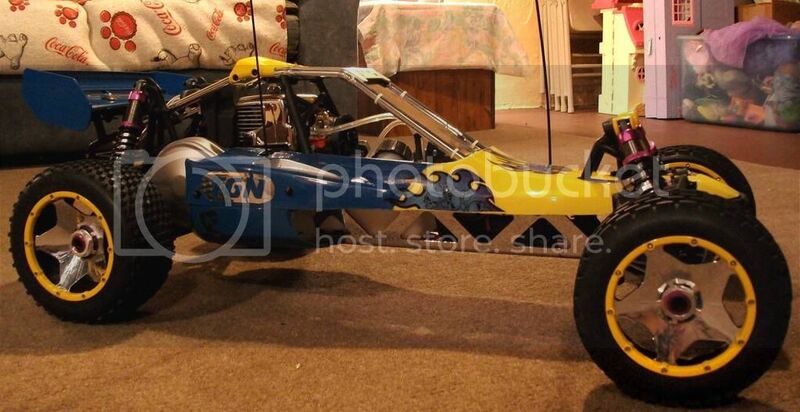 Very fun Buggy..
Whats the differance in the old and new motors? I got a km baja 3 weeks ago and it seems to run fine,i added a pipe and upgraded the clutch spring. This is from his drect experience using, rebuilding, upgrading, and running them. His explanations are very good and very in-depth. Well, I just orderd one I hope to have it next week. also there is alot more positive feedback on this buggy than there is negative, think long and hard and do youre research. you will end up upgrading whatever you buy regardless. I think he alreay bought his KM a couple of months ago. And since he got it directly in China, I will not be surprised if he was able to haggle the seller down to around as little as $300 USD (This is just a guess, but considering no import fees, 2 or 3 less middlemen, the sales price for buying directly there would have been way cheaper). No, that is the Factory price that YOU as the seller (or distributor) would pay. What it costs the factory is definitely cheaper, they too want to make money so that is why they have a factory invice price. Well, then, there your go, you can negotiate the factory price, so long as the factory actually makes something (i.e. doesnt go neg as compared to what it cost them to actually make it). factory have china market. you can not go to them and ask for 1 unit. No, I was referring to what you, the seller or distributor, does as far as haggling the price with the factory. You in turn tack on your own mark-up, and that is how the market is protected. the sq/km/fs and other rc are helping the hobbiest to stay in the game at realistic price. look at the pricing... how much you paid a year ago vs. now? i'd be more appreciative to the new entries... this make the true competition... and the benefits are the consumers..
clone or not clone is not the issue. if you want to stay with one brand, you are free to do so. You dont watch much racing do you? the clone or what ever is helping the market to stay healthy. look at the price for smartech... fg hpi.. how much were they a year ago??? how much are they now??? IBM wad dominating the PC market. Until CLONE comes..
And see how much A notebook cost 10 years ago vs. now? Iphone have is holding strong cos no comparible competion. So, price HIGH and huge profit margin (try it with no contract and no ATT). let the competion begin (between factories). You are the winner. the newbies will get more experience and improve (look at km01 vs 02). why KM can produce a car less than 350.